As you might know, I was hacked about two weeks ago, right after the blog post where I suggested ISIS-Daesh are not real Muslims. The hackers have continued daily to bring down all my websites and they are still rattling around inside my servers and files even as I write this. This was one of their badges left on my new Syrian Refugee blog. So I am shifting my blog back over to Typepad for a while where it will be safer and I won’t have to have to play catch up everyday with these “Muslim” hackers. And a very, very Merry Christmas to my hackers. In order to say Merry Christmas to ALL my hackers, I had to dig a little deeper. Hope I am including everyone here – its a wonderful Christmas surprise and I wouldnt want anyone to miss out. 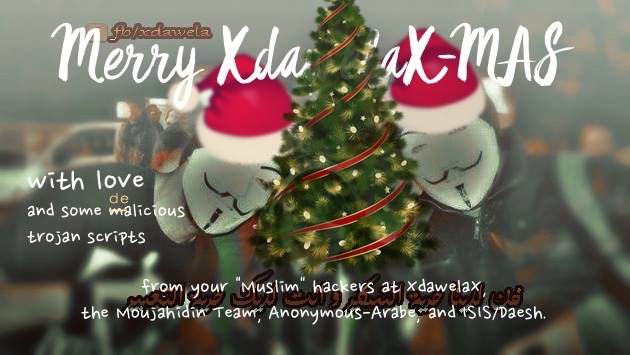 Merry Christmas to the Moujahidin Team in Algeria who left their badge on a few of my broken sites, the hackers at XdewelaX, Anonymous-Arabe, to crazzyguycool@gmail.com, azizchouaf@gmail.com, and any other ISIS-sympathising hackers involved in taking down my sites, or just some young greedy hacker like Abdul Aziz Yassin Hua (عبد العزيز ياسين شواف) of Algeria who has threatened me with “force” on facebook and has been attempting a Paypal phishing scam from my site over the past two days. Hey Abdul, you need to work on your English spelling. Despite all the “Muslim” rhetoric, it’s apparently all about the money. As Abdul said on Facebook, its “getting $ for hacking Facebook”. But Christmas is not about the money or greed or hate or revenge. Its about peace on earth to all men and women and children. The Salam from Isa al-Masih is for everyone. And so I wish peace to my “Muslim” hackers this Christmas. May Isa al-Masih Himself visit you in your dreams this Christmas and give you peace, and guidance and wisdom and “baqa” – the sobriety-after-drunkeness – that your great Sufi masters often talked about. May Allah give you ‘baqa’ so that you can discern right and wrong, and see through the confusion that ISIS has planted in your young and vulnerable minds. With this wisdom, you could use your computer science skills to help the world, to help Syrian refugees, to help spread peace instead of hatred.
. . . because you have been naughty this Christmas! Its tradition. But hey, its not too late to change from petty paypal thieves and ISIS-minions to become agents of peace and love. To help you do this, I will be adding some Christmas cards to the folder so that you can send them to each other and spread the Christmas cheer around. I hate to show them early and ruin the surprise but here are a few of them. Spread the love, my dear hackers. And if you wish to repent and do right, I suggest you donate some of your stolen money back to charity. Give it to the Syrious Love campaign that funds efforts to bring compassionate care to the 4 million Syrian refugees who are suffering because of the atrocities of Daesh. Syrious.Love was one of my websites you took down last week. I will launch it again soon, because the refugees are on my heart this Christmas and a major part of my current projects. And so, I say to all of you, have a very, very Merry Christmas! After taking a look at some of the Facebook accounts of the hackers and seeing who is friends with each other, and who is the biggest showoff (probably Ahmed the PayPal thief), I thought I would post a few links here for my friends to personally wish them ALL a Merry Christmas. If you feel you are wrongly named in this list, please email me and let me know.